With so much happening, don’t forget this is your last opportunity to get your nominations in for special awards with the deadline of March 31. Come April, your BOD will review the submissions, plan the annual meeting, appoint a nominating committee to recruit new board members, review any rules that may need to be tweaked and attend rides in between. It’s going to be a busy couple of months! In fact, it has been a busy year! Our membership continues to grow, our website and FB page have become a go to for rides and informative articles and your BOD has been amazing every step of the way! Thank you all! Welcome! New SEDRA member Jenny Drake! Advertising Opportunity – I had a “lightbulb” moment and I personally think it’s a good one. We sell advertising space in our membership directory every year. This year we have already confirmed a few National advertisers, but this is also a great opportunity for our members to get the word out on what they do too. Do you sell real estate? Train horses? Massage therapy? Farrier? Do you use someone who would benefit by advertising to our membership? Advertising rates are as low as $25. We only have one Level 4 remaining at the time of this publication. Level 5 has been sold! I have attached our flyer for further information and requirements. Act now to get the best position! Kim Minarich is our go to person if you have any questions. Annual Meeting – Save the Date! Our annual meeting will be June 30 at the Black Prong Equestrian Center. I am excited to announce that this year we’ll have educational seminars throughout the day, followed by the membership meeting, awards, and dinner. We’re in the processing stages for our seminar speakers and presentations. 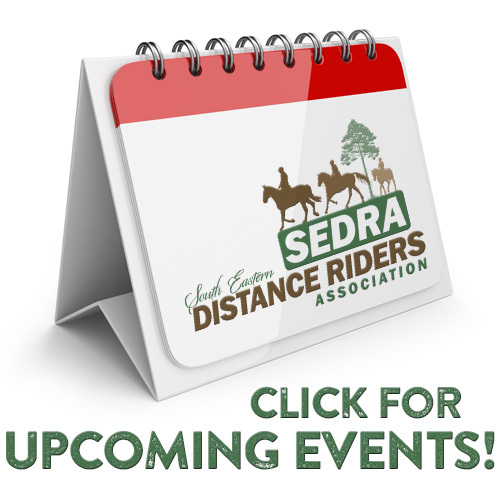 This year’s meeting will be a great opportunity to bring someone who is interested in distance riding as well as seasoned riders learning on how they can improve their horse and themselves. AERC Convention –Several members will be attending the AERC convention and will report back to us on what they learned from the seminars they attended. When I went to the convention in Atlanta a few years back, the knowledge gained was worth every penny. I’m looking forward hearing about their experience and are thankful they are willing to share the information. The weather was perfect in late January and the trails at Broxton Bridge Plantation were in the best shape ever. 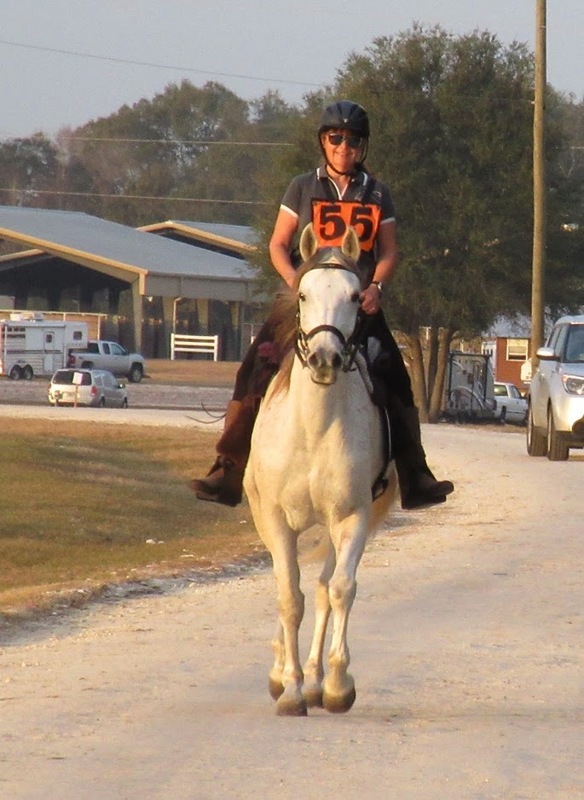 33 horses started the 160 km, 100 mile ride, the majority of them pushing for a COC (certificate of capability) to become eligible for WEG in Tryon, North Carolina, USA in September. There were athletes from 13 different countries. There was a shocking 28% completion rate with only 9 of the 33 starters successfully completing the ride. Of the 9 that completed, 5 of the 7 horses in the CEI 3* earned a COC, with one of the other horses already having a COC. The second day for the 25/50/75 mile distances, the completion rates were much higher given that riders need to qualify only at the 100 mile, 160 km distance. Lots of discussion ensued about whether FEI vets are tougher or whether AERC vets are not following the AERC rules. The AERC rules ask for FIT TO CONTINUE as the final criteria. We have often seen that horses may be FIT TO FINISH but not FIT to continue….so we are looking forward to a lively discussion at AERC convention later this week. World Equestrian Games Information: Tryon2018.com. The endurance test event will be held April 26-28. SEDRA member Sabine Dickel is on a USA tour with her mare Gaya; traversing the trails throughout the country together. Sabine has created a link where you can keep up with what competitions she has entered and when not competing where they are camping and riding for pleasure. 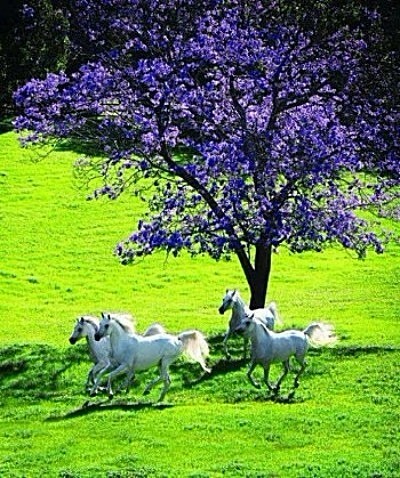 The photos show a countryside that is simply beautiful. Her trip hasn’t been without a few glitches though. Indy and I had a gold star ride from the minute I got on and walked calmly out of camp. He easily picked up a trot with our riding buddies Tiny & Maris and off we went on the 21.5 mile loop. Both horses were strong with their riders throwing out a few cuss words and slow down requests thrown in here and there when our arms were pulled out of their sockets. We were back in camp in about 3 hours and vetted right through. Indy never stops moving so Tom (who graciously volunteered to crew for 5 women!) assisted with keeping him entertained and feeding him hay. 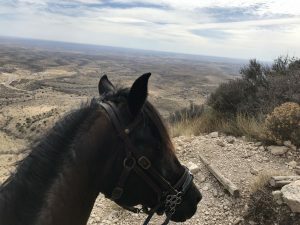 Second loop was 18 miles with both horses once again ready to leave camp and make time. On this loop we started passing LD riders, many hand walking next to Black Prong as there was a carriage event in progress. They are on the same trail we are on so it was interesting here and there but no real problems unfolded from what I saw. Tiny & Indy were the only 2 horses on this loop (as far as they knew) so we had a pleasant ride with no arm yanking, head tossing or cussing. Next thing you know, were back at the road that takes us to camp. I had Tom trot Indy out for me and he looked great. His CRI was wonky but a good pee cured that. Last loop was 12 miles. It was a nice loop but the sand was deeper than previous loops here and there. With the horses tiring, we walked the deep stuff, took more time to allow them to eat grass and they sucked up the water too. Each loop was a tad longer than the projected mileage so by the time we got back to the road, we were at 50 miles with 2 more to go. The final 2 miles brought us back to camp through the woods on the deep sand trail the locals train on. We walked but then saw the finish line poster so we picked up the trot. And we trotted and trotted. We realized this was a never-ending road so we started walking again where another finish line poster was set up. We picked up the trot again. Still no finish line but now we also have others behind us so we all continue to trot in finally seeing the real finish line. Whoop-whoop! Maris and I tie for 5th, Gayle and Allison tie for 6th and Olson’s rider Vera, came in 7th. All the horses looked great and we walked on into camp. Now Indy is hungry and is non-stop eating while we pull tack. Maris goes up, vets through, completes! Tom and I take Indy up and he goes to trot out and the vet says stop, “you done”. Just like that…BAM. I remind her that I am not FEI. Once they show me where he is off at we find a muscle cramp high up which we massage out. We go to re-present, and Indy is much improved. CRI 44/48, all A’s and another sorry, you don’t complete. Balloon busted. We didn’t see the lameness but the vets did. Dang-it! You know what they say? You’re not an endurance rider until you have a finish line pull. Next ride is McCulley’s. We’ll hope for a better ending there with the same start and middle. Have a ride story you want to share? Ride managers, do you want to brag about how pretty your ride location is? Send me your stories, your pictures, your ideas…I’ll put them in the newsletter!